If all you’re looking for is an office chair, this BestOffice mid back ergonomic office chair is probably as good as it’s going to get. This is a low-cost, no frills office chair, suitable for standard computer desk work. It comes in some nice colors besides a standard black. This includes a vivid red, which will stand out in any office environment, as well as plain white, sure to have turned gray after a few weeks of use. 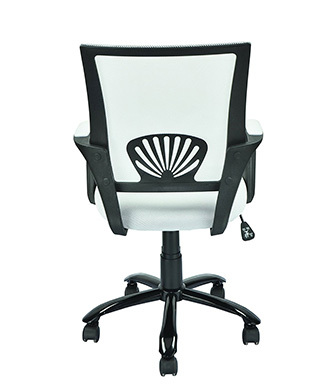 One of the lightest chairs you’ll find, the BestOffice mid back office chair weighs just 22 pounds. This is thanks to its relatively small, plastic design. The seat is marked at 19 inches wide by 19 inches and while having a decent foam cushion, is covered in a mesh material. This will do some to increase breathability. With armrests, the chair measures 22 inches wide. The small design of the chair allows it to support users up to 250 pounds. While it may be able to support someone larger, the relatively small frame will most likely not be comfortable for anyone over that rating. The seat is height adjustable, specified from a low of 19 inches up to a high of 23 inches. Some customers have complained about this though, indicating the maximum height is not as high as specified. The BestOffice chair is fairly short on features, but that is understandable at its price, and it still manages a res pectable offering. Set on 5 caster wheels in a star configuration, the chair can swivel 360 degrees and has 4 inches of height adjustability. Two armrests are integrated into the structure of the chair, the tops of which are cushioned and covered in color coded mesh material. The backrest is fairly flat with a plastic frame and mesh covering. This does well to support people of varying frames, and an additional plastic shell is located in the lower back, adding some degree of lumbar support. The chair comes packaged in a small box and requires some assembly. No additional tools are required, and a single chair comes together quickly and easily in less than 15 minutes. The standard gas lift spring is controlled easily by the handle mounted on the RHS, and it doubles as control for the tilting of the chair which can lock in an upright position. Tilt ease can be adjusted with the knob located under the front of the seat. In the same way that we started off this review, we will end it. This is an office chair. That’s all it is. If you’re trying to get an office chair on a budget, you can definitely do worse, but don’t expect too much from it. The chair is well-regarded by its customers, thanks mostly to its apparent comfort at this price, although people taller than 6 foot may appreciate a larger chair. A good deal if you’re looking for a no fuss office chair with a dash of style.